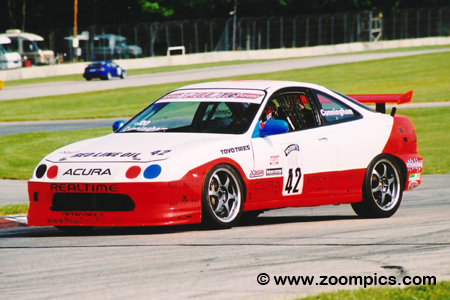 In 2002, the Sports Car Club of America’s (SCCA) World Challenge Championship was in its thirteenth season. For the fourth year Speed Channel was the primary sponsor – (in the off-season the Speedvision channel was renamed Speed). 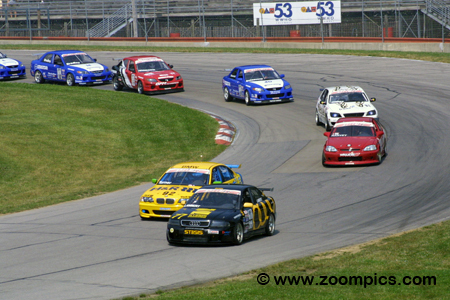 SCCA had developed a successful format that attracted competitors and fans. Race weekends included two standing start fifty-minute races – one for the Grand Touring class and another for the Touring Cars. Grand Touring (GT) – The GT class rules accommodate an extensive range of vehicles from different manufacturers. There is no limit to the engine displacement in this category and vehicles may use a forced induction system. To stop the cars, alternative materials may be utilized for the brake pads and shoes. Rules also allow the use of four-piston calipers but rotors are limited to 14-inches in diameter. The maximum diameter of the wheels is 18-inches and any changes to the bodywork must be approved. The series uses a spec tire and competitors race on Toyo Proxes RA-1s. Touring Car (TC) – The Touring Cars are limited to an engine displacement of 2.8-liters. The motors must be naturally aspirated (turbochargers or superchargers are not permitted). The Touring Cars are also allowed four-piston calipers and alternative materials for the brake pads and shoes but the maximum rotor diameter is 12-inches. Wheels in this group are limited to 17-inches. Cars can be fitted with a spec rear wing and approved aftermarket bodywork. This category also uses a spec tire from Toyo – the Proxes T1-S.
To prevent any driver/car combination from dominating the class and ensuring tight competition, the R.E.W.A.R.D.S. System was implemented. Introduced in 1995, R.E.W.A.R.D.S. is the acronym for ‘Rewarding of Equalizing Weight Assigned to Reduce Driver Sensitivity.' This weight equalization rule adds or removes ballast from a car based on the finishing position of a driver. There were eleven-race weekends during the 2002 season. The opening round was in March at Sebring International Raceway followed by back to back race weekends in May at Mosport Park and Lime Rock. The teams would take a break until the end of June when they would travel to the Mid-Ohio Sports Car Course. The series then moves to Road America followed by the inaugural National Grand Prix at Washington, D.C. After these weekends the championship returns to Canada with a stop at Trois-Rivieres and a second visit to Mosport – just for the Touring Car category. The teams will head west in September and compete at Mazda Raceway Laguna Seca. The penultimate rounds will take place at Road Atlanta and the series finale will be held at a new venue, Virginia International Raceway. The Speed World Challenge series returned to the Mid-Ohio Sports Car Course after a two-year absence. Drivers would compete on the thirteen-turn 2.258-mile road course for fifty-minutes. Rookie and pole-sitter, Paul Lambert driving the Stasis Audi A4 leads the field of fifty-two starters into Mid-Ohio’s ‘Esses’ on the first lap. 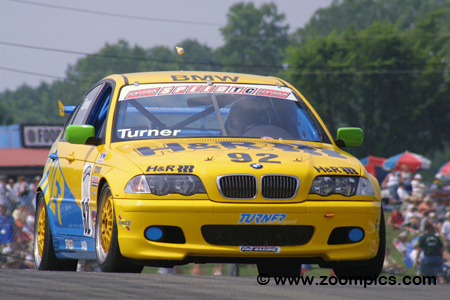 On his quarter panel is the BMW 325i of Will Turner who started on the outside of the front row. Trailing these two are the Honda Civic Si of Taz Harvey, who is second in the title chase, and fourth fastest qualifier, Mike Fitzgerald in the Team Franz Blam Racing Lexus IS300. Starting on the outside of the front row just 0.077-seconds slower than the pole-sitter, Paul Lambert was Will Turner. Turner was driving the No. 92 BMW 325i prepared by his race shop. He chased Lambert until a lap-9 restart when Taz Harvey slipped into the lead. On the eighteenth circuit, Turner grabbed first place and went on to score his first victory since Pikes Peak International Raceway in 1999. Paul Lambert captured his first-career Woody's Ice Pole Position for the SPEED World Challenge Touring Car race at the Mid-Ohio Sports Car Course. It was also the first Touring Car class pole position for Audi. Driving the No. 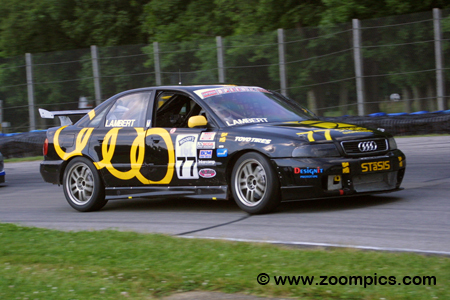 77 Stasis prepared Audi A4, Lambert led the first nine laps but lost several positions on a restart. He was forced to pit later in the event to replace a flat tire. At the checkered flag, Lambert was in twenty-third. 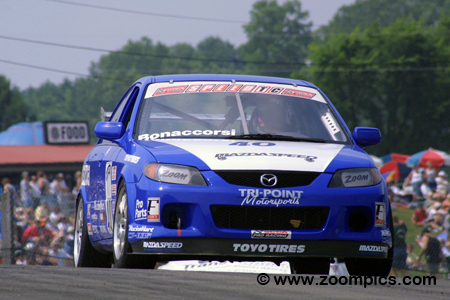 Gridded sixth for round four was Paul Bonaccorsi driving a Mazda Protege ES. Bonaccorsi results were improving with each event. At Sebring, he recorded a sixteenth place but in his most recent outing at Lime Rock, Bonaccorsi was sixth. During a lap-9 restart at Mid-Ohio, he moved from fifth to third and then passed Taz Harvey for second on the eighteenth circuit. Bonaccorsi held the position and grabbed the runner-up spot. Series veteran, Taz Harvey had his best qualifying performance of the season. To date, his best starting position was an eighth at Sebring but at the Mid-Ohio Sports Car Course, he was third quickest. During the race’s first restart some aggressive driving gave Harvey the lead. He held the top spot for nine laps until he lost the position to Will Turner. Two circuits later, Harvey was passed by Paul Bonaccorsi and would finish third. 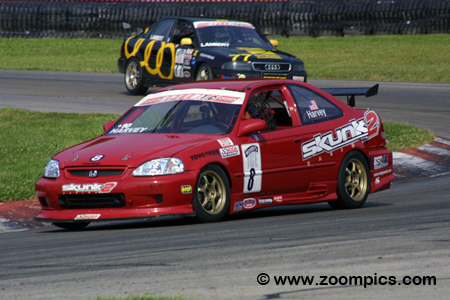 The last time the series competed at the Mid-Ohio Sports Car Course, Pierre Kleinubing qualified on the Touring Car pole but finished second. 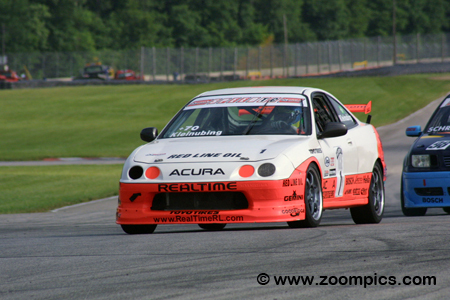 In 2002, Kleinubing driving the RealTime Racing prepared Acura Integra Type R was only ninth quickest in the qualifying session. On the first lap of the race, he fell to eleventh place. During the event, the defending series champion moved to eighth which was his worst finish to date. 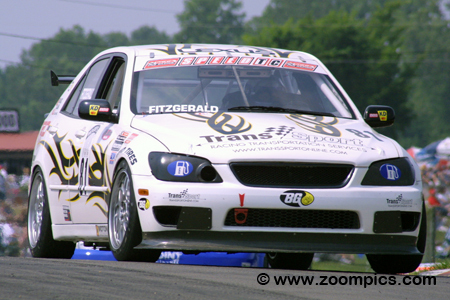 The Team Franz Blam Racing prepared Lexus IS300 driven by Mike Fitzgerald was at the top of the timesheets in both practice sessions. In qualifying, Fitzgerald went even quicker but it was only good enough for fourth on the grid. He held his position in the race until lap-9 when he was passed by Paul Bonaccorsi. When Paul Lambert had his tire issue, Fitzgerald moved back into fourth and would remain there until the checker. 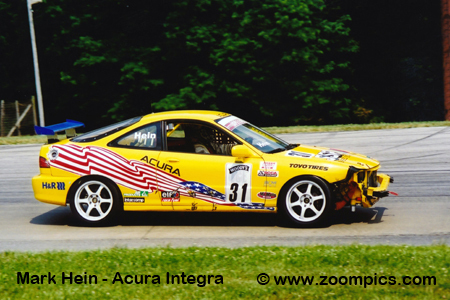 In the previous round at Lime Rock, RealTime Racing team leader, Peter Cunningham qualified on the pole. Unfortunately, Cunningham lost the lead to his teammate, Pierre Kleinubing when he hit some oil on the track. At Mid-Ohio, he was seeking redemption. At the end of qualifying, Cunningham was forty-seventh quickest in a field of fifty-two starters. During the race, Cunningham gained thirty-four positions to finish thirteenth. 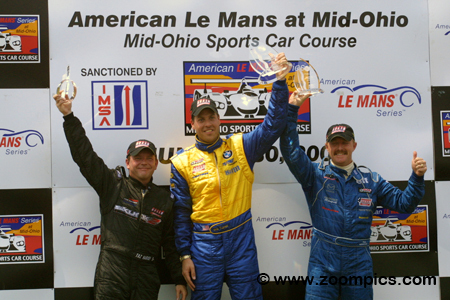 The 2002 Speed World Challenge Touring Car podium for round four at the Mid-Ohio Sports Car Course. In the center, winning his first event since 1999 is Turner Motorsports’ Will Turner. Standing on Turner’s left is Mazda driver, Paul Bonaccorsi earning his best result of the season. Another driver having his best finish of the year and completing the rostrum is Taz Harvey.